The frozen Lakeland ghylls can be stunningly beautiful and can give a great variety of short-pitch climbing for introducing crampon and ice tool techniques. 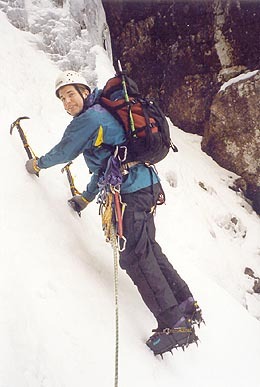 On the higher crags of the fells, snow-filled gullies are ideal for teaching basic snow craft, while the bottoms can offer good mixed routes. Perhaps best of all are the long ice smears which form quickly when a cold snap follows a wet spell. Here we can guide you while learning the pleasure of making your own holds with ice tools and crampons on a thin, ever-changing medium. We'll show you how to place ice screws and make threads in the ice. This can all quickly become addictive, and soon you'll be wanting to follow us to the magnificent ice fields of Colorado, USA. We offer courses and short breaks in both the Lake District and in Scotland. In the past we have also led trips to Colorado, but these have temporarily been put on hold due to changing liability and insurance requirements in the USA. Whilst we try to tailor our activities to your fitness level, ice climbing is one of the more demanding outdoor adventure sports. As a general guide, you will need to be of at least average fitness and be willing and able to cope with sometimes cold and/or inclement conditions. Good arm and wrist strength would also be an advantage. Remember that conditions can change rapidly in the hills, so always be prepared! It is often worth bringing along a spare set of clothing (and comfortable shoes) to change into at the end of the day. Current mountain weather conditions are reported by the National Park Authority. 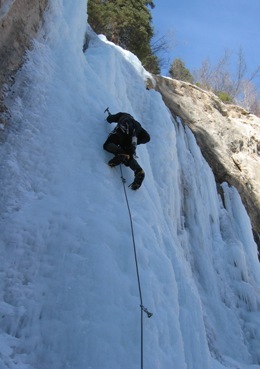 We also make regular trips to the renowned ice climbing of the Colorado Rockies and throughout Europe. Blea Water Ghyll, Mardale, Lake District. Photo © Steve Morgan, Go Higher. Steep waterfall ice in Rifle, Colorado..